Good Afternoon to you all! The kids are making a huge snowman outside so I am counting on a little bit of time to be able to post this! It has been ages (it seems) since I participated in any of the challenges. Last night I was able to get some cards done and I made this one for Friday Sketchers. I really love the Magnolia Valentine Collection. Is it me or are they getting cuter with each release? I have modified the sketch a little and tilted the middle tag! If you stop by tomorrow, it is my turn to host a Whimsy Blog Candy. I'll have a cute Whimsy animal stamp AND a sentiment set up for grabs and since I just noticed that sometime over Christmas my counter went over 30 000 hits, I will add a few more goodies just to sweeten the deal! 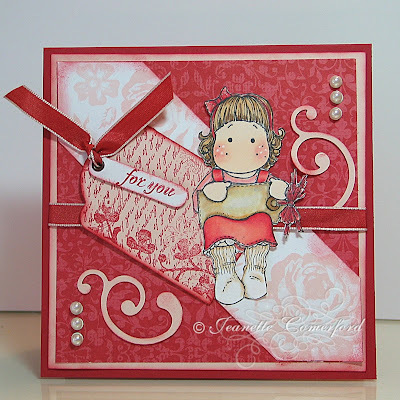 Gorgeous card, love the beautiful image and your wonderful colouring. OH, she's super cute! I ordered her and can't wait to get her! Such a sweet card! awww jeanette this is a totally sweet card, love the colours and the gorgeous image that you have beautifully coloured...i am trying so hard to sit on my hands and not buy any more magnolia's at the moment. but you are making it so difficult for me to resist!!! lol..
Oh my Jeanette, love it!! The colors are just gorgeous together!! ebautiful work!! Hugs for a Happy New Year!! Jeanette what a fabulous card! And yes you are totally right that the Magnolias just keep getting cuter! I so need to get this little Tilda for my collection! Adorable card Jeanette, such a beautifully coloured Tilda...love the placement of the tag. I agree with you, the Magnolia's are getting cuter...I just can't resist them unfortunately! I love the flourish...I must try and find one of those punches! oh wow.. how pretty this card is jeanette. Just beautiful! I love the papers and the colors are so soft. And I love the tilted tag! What a lovely card. You have coloured the Tilda in lovely. I haven't used my new valentine Tildas yet so I think I should have a go soon. Wowzers!!! this is SO precious!!! ahhh . . . . such a lovely card. I think everything I would say has been said by others. Just wanted you to know how much I like it. et pour finir bonne année bonne santé pour l'an 2009 et encore plein de super creation !! !